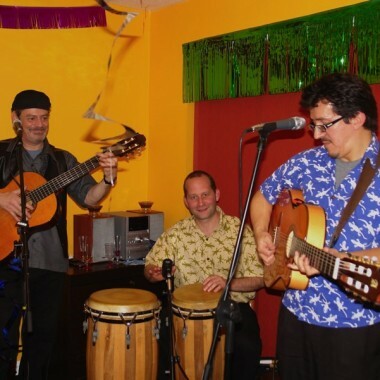 Two of the most experienced Latin guitarists in the London Latin music scene, Guillermo and Juan Carlos join forces to create an exciting acoustic sound. They can perform as a trio, quartet or full Salsa band. 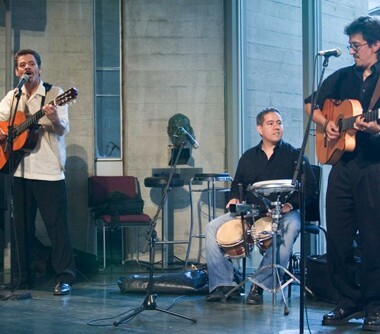 Band leader with London based Latin ensemble Calarcá, Juan Carlos is an always inventive improviser. His distinctive style makes him a favoured player with bands like Conjunto Sabroso, La Charanga del Norte and The Magic Carpet Trio. He is also a composer for image, film and TV. Well established singer-guitarist, Guillermo sings with popular band Merengada amongst others. His characteristic voice brings to life the unforgettable tunes of Latin-America – everything from Boleros, Son, Cumbias to Mexican corridos. He is a natural when entertaining the most varied of audiences. Guillermo is a painter-sculptor and a busy Carnival performer.